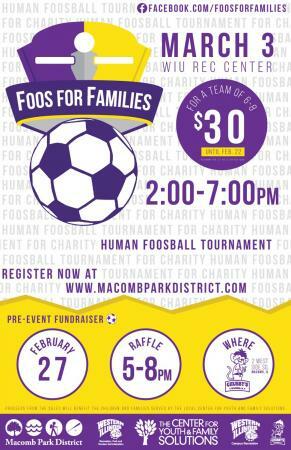 MACOMB, IL — Several individuals—representing key sectors of the Macomb community, including Western Illinois University faculty and students, the Macomb Park District and the Center for Youth and Family Solutions (CYFS)—are busy planning the fourth annual Foos for Families Human Foosball Tournament. This family-fun activity will take place Sunday, March 3, with all proceeds benefiting CYFS. According to Jeremy Robinett, assistant professor in the Western Illinois University Department of Recreation, Park and Tourism Administration (RPTA), the tournament will take place at WIU's Campus Recreation Center. The event will feature teams of six-eight people, over the age of 14, playing on an enlarged foosball field. To register teams, visit the Macomb Park District website at macombparkdistrict.com. The cost per team is $30 before Feb. 22 and goes up to $40 per team after that deadline date. 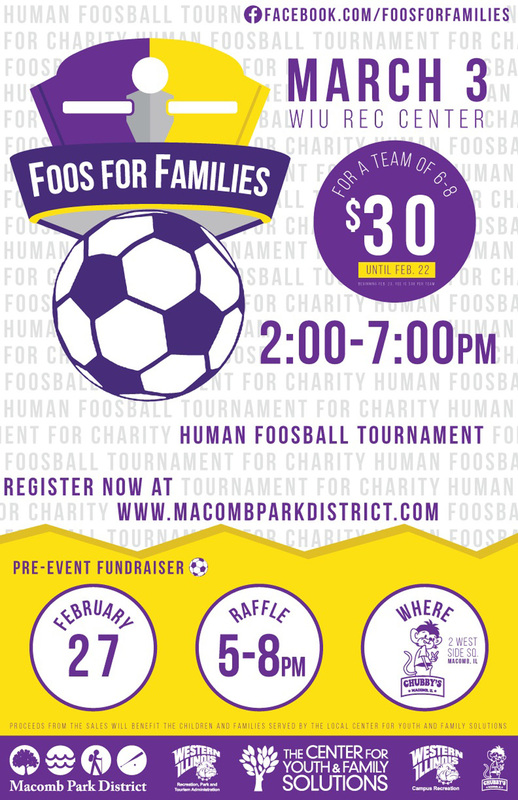 There will also be a Foos for Families benefit, including a raffle, taking place at Chubby's in downtown Macomb from 5-8 p.m. Wednesday, Feb. 27. A portion of the dinner sales will benefit the event and there will be a variety of raffles. Students in Robinett's Spring 2019 RPTA 467, "Event Planning and Management," course are responsible for planning and promoting the event, as well as providing labor during the tournament. "We're excited that Campus Recreation has agreed to host this year, so come snow, rain or shine, we'll be playing," he said. "The tournament will start at 2 p.m. Each team will have the opportunity to play at least two games. We'll also have tailgate style games so that there will be plenty to do while teams are waiting for their next match." Robinett explained that representatives of each participating organization draw on their organizations' strengths and resources to contribute to the success of the event. "For example, the Macomb Park District provides promotional materials, a registration site and the equipment (staff at the Macomb Park District constructed the portable foosball courts), and because the CYFS is a non-profit organization, the event has non-profit tax status," said Robinett. "CYFS staff also provide us with contacts and help from its friends and donors. Cassady Martial Arts, an annual sponsor, has stepped up to help us with marketing the event. WIU's Campus Recreation Center is providing us a home for the event so we don't have to worry about the weather as much, and our students provide their labor and energy to infuse the event. It is a wonderful opportunity for students to apply the knowledge they were gaining in class to a practical, community-based activity." Depoy shared that generous sponsors have already come forward this year. "Without the generosity of our donors, Foos for Families wouldn't be possible," she said. "We're very appreciative of their support." Individuals or agencies interested in learning more about sponsorship can contact Depoy at (309) 833-1791. For more information about the events, contact Robinett at (309) 298-1967 or visit the Foos for Families Facebook page (facebook.com/FoosforFamilies).